Happy 2nd day of Spring! Are you enjoying the same beautiful weather I’ve been enjoying the last few days!! God’s giving us just a little glimpse at the Spring to come and boy am I ready for it. 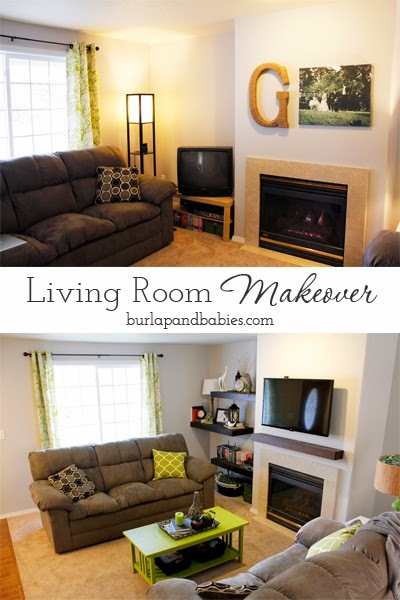 Today I am going to finally show you our living room makeover from start to finish. Here is the room that we started with. Plain. Boring. No personality at all. I had big dreams for this room from the day we bought this home and it just took us seven months to finally feel at home in this room. On Black Friday this year, we finally grew up a few years and bought a flat screen tv, a huge upgrade from our big tube tv that I’ve had since freshman year in college. After getting that we had to upgrade the rest of our life with floating shelves. 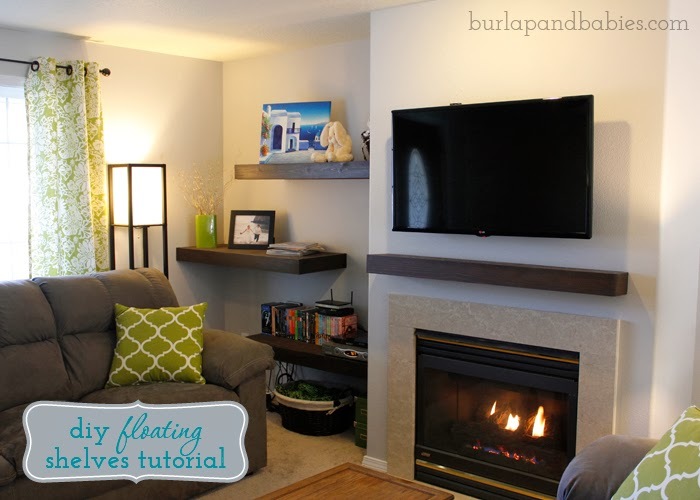 You can read all about that in my floating shelves tutorial. Once I had the shelves built I really needed to work on our decorating and tying the finishing touches all together. 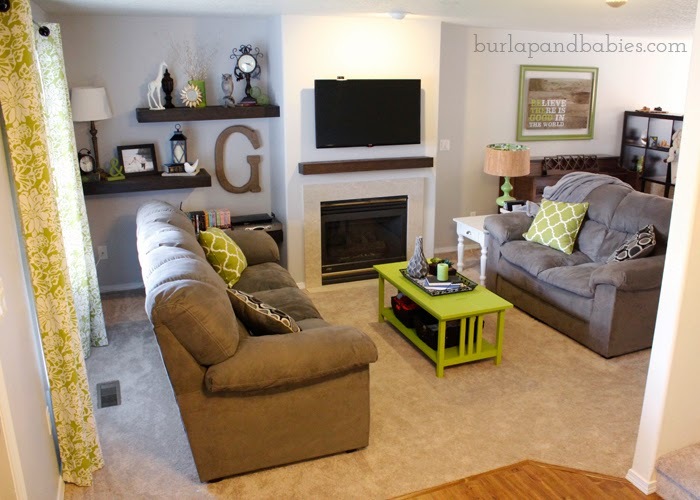 Most of the accessories for the new floating shelves were found at either Goodwill, Ross, or Target. 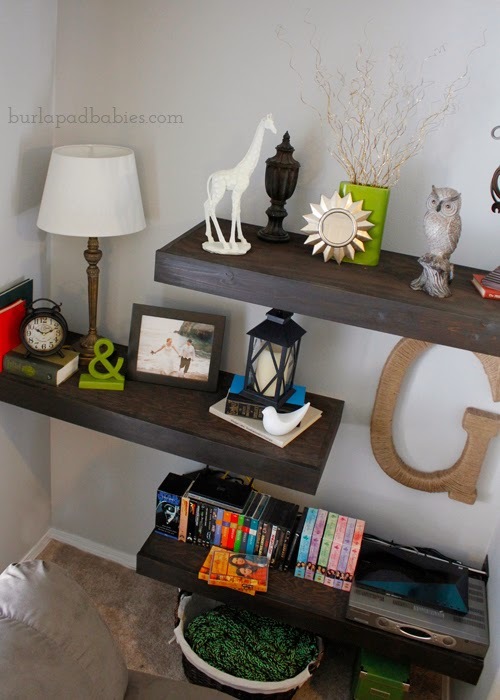 You can find more all about decorating the shelves here. Of course, every great living room needs a coffee table to put your coffee cup and book on so off to my favorite place I started searching for the perfect coffee table. I finally found this one at Goodwill for $15. 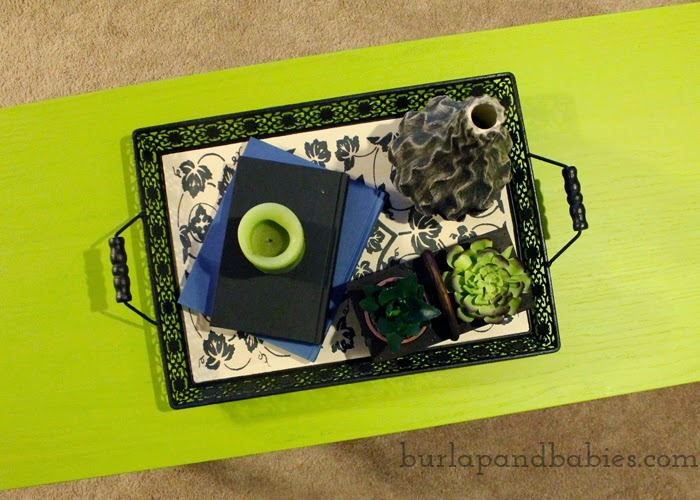 After painting it a lovely bright green to match the curtains and couch pillows, and added some organization below. 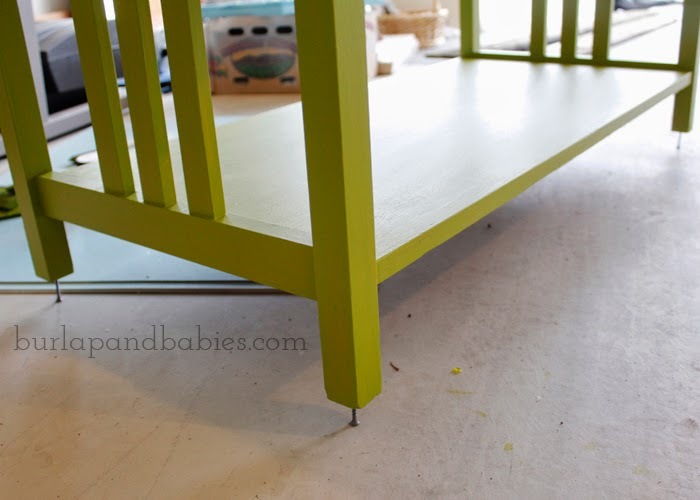 One trick on painting furniture that I will ever be grateful for is to pound a nail in each leg of a table before painting it. 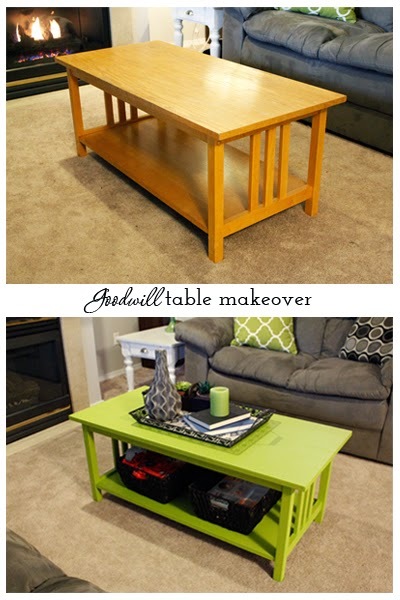 Then you can paint the whole table without it sticking to the ground. Genius! 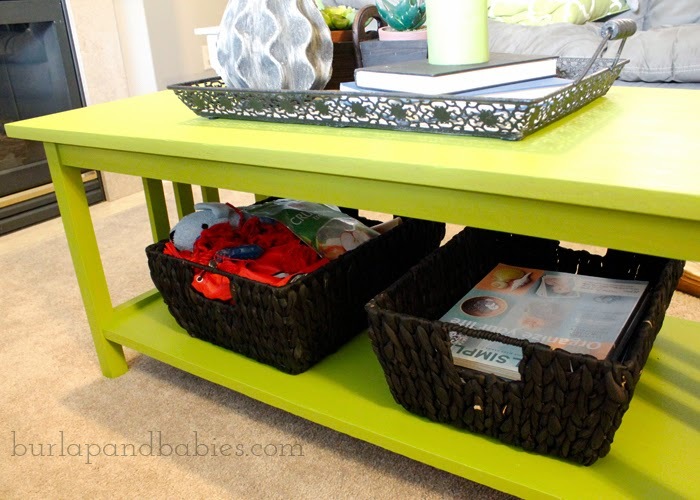 The baskets you see below the table top I found at JoAnn Fabric for 50% off. One basket is for all of of the dog toys that are usually strewn around the living room and the other one is for books and magazines. They’re great to have to just throw stuff in if people are coming over on short notice. On top of the coffee table I made over a tray I bought from Ross that was $12.99. 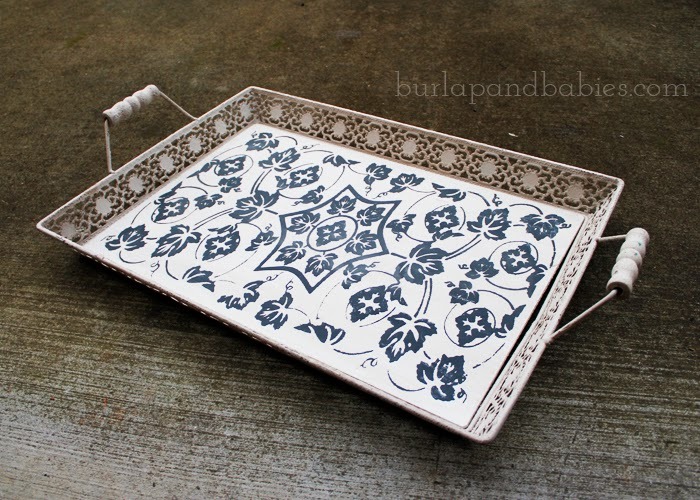 It was all cream which didn’t go well with our color scheme but I loved the design on the bottom of the tray so after taping wax paper to the bottom of the tray, I spray painted the frame and handles with some leftover black walnut spray paint I had laying around. On top of the tray I gathered different clearance and thrifty items to add some finishing touches. The faux wood tall vase is from Ross. The hardback books are from Goodwill. And the fake plant box was found at Goodwill for $1.99. When I brought it home, I sanded it clean and stained it using the leftover stain from our floating shelves. 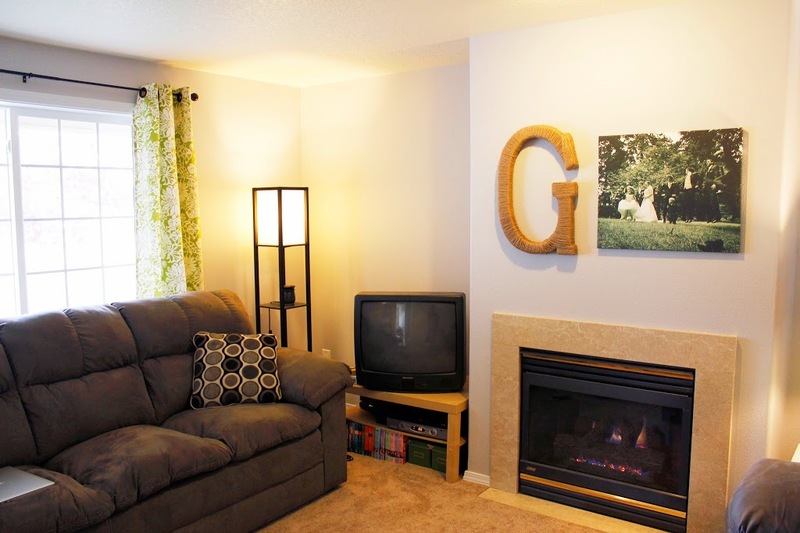 I love how it all turned out and came together to help tie the whole room together! 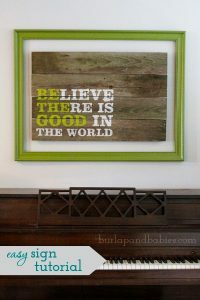 And as I showed you last week, I made this awesome – well at least I think it’s awesome – wall art out of old fence boards to go above our piano. Now when we walk in the front door, this is what we see. I am so in love! And here’s our amazing progression from our boring, dull living room from four months ago, to once the shelves were built, to finally now. All finished and put together and lovely. What rooms have you made over recently that you’re proud of? I’d love to see! Leave a link in the comments below. I adore your room!!! You did such a great job!!! I’m loving everything you did especially the table, the color is really a statement and give an effect with the entire design. Thank you for this. Awesome post! Very creative. Thanks for sharing.